This is the photo inspiration for this week's challenge at the City Crafter Challenge Blog. 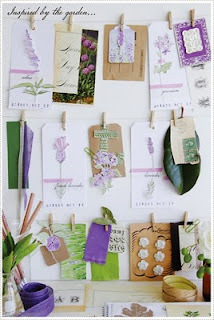 The photo is called 'Inspired by the Garden' by Leslie at A Creative Mint. So the challenge is to create a card or project using any color from the photo and it must include something mail related (e.g stamp, text, envelope, postcard etc). I chose the lovely violet color with a touch of soft green for my card. I also made this with the Moxie Fab World Card Style Week Shabby and Vintage Challenge in mind. Ok, there's a lot going on with this card both inside and out so that's why I took so many pics. It'll be like a little journey, a voyage through my card!! : ) Ok, here we go, hopefully I won't lose my internet connection in the middle of this!! On the front, the printed paper is from Webster's Pages Petite Pages, I went with the lavender tones from there. I stitched the edges and softened with blending chalks in soft green. I layered some lilac lace and added all those sequins. The stamped detail above the lace is from Victorian Fripperie by Waltzingmouse Stamps. I used more from this set throughout the card. Inside I used a postcard digi image for a place for someone to write a special message. The postcard is from the Honeychurch set by Kenner Road available at Two Peas in A Bucket. I distressed the edges a little more with blending chalks and inks. The oh so cute little crochet heart is from Annie Design at Etsy, a lovely Irish lady makes these adorable hearts and a wonderful array of crochet flowers in every color imaginable. I'm addicted to her stuff!! I added the little lavender bow myself. So, here's the full view of the inside and the back. I painted the little paper rose in Light Purple and Lavender Creative Inspirations Paint. The buttons are from my big bag of buttons!! I stamped a little more from the Victorian Fripperie set by Waltzingmouse Stamps on the back of the card. The pretty paper is from Webster's Pages again. I think the button and touch of ribbon make a nice full stop at the end of this card. Just in case you were wondering what was on the back of the accordion fold I just used some lovely striped paper from Anna Griffin Old Paris Palette Decorative Impressions Paper Pack. I softened the edges with some lavender blending chalks. I need a cup of tea!! AND a biscuit (cookie)! Other: Creative Inspirations Paints in Green Olive, Light Purple and Lavender, blending chalks, sewing machine, natural twine, purple chiffon fabric, purple satin fabric, selection of buttons, lavender sequins, lilac lace, lavender seam binding, lavender organza ribbon, distressed ribbon from Prairie Bird Boutique at Etsy, lavender satin ribbon, flat backed pearls, crochet heart from Annie Design at Etsy, paper rose. Absolutely stunning!!! All the work you put into your projects is amazing.I love all the papers and embellies you've used.I'm just awestruck with your gorgeous work. AMAZING! I am glad you took so many pics because there was INDEED so much goodness going on! LOVE it all!!! This is over the top gorgeous! All those sweet little details add up to a big WOW! If you don't get some kind of recognition for this, they are blind!!! Wow! Such a stunning creation! Thanks for sharing all the details! Love, love, love it. What else can I say? It is stunning work. The large purple flower is gorgeous. Please have a tutorial on that. TFS. This is a WOWZER!!! Love all the details and texture, lovely creation! Thanks for playing along with us at CCCB! wow claire this is just fantastic, I love love love it. Wow this is really beautiful; love it! This is sooooo beautiful! Can't wait for the flower tutorial. Thanks! Oh I LOVE this card! You really nailed this challenge. I made several cards for this challenge but in my opinion, your tag card is the hands down winner! Great job Clare! This is wonderful! So full of gorgeous embellishments. I love the purple flower! Perfectly gorgeous!! I couldn't love it more!! what a beautiful card! i love all your designs, they are all so detailed! Well this is so so Beautiful.. anyone who would receive this would be so lucky.. Do you need my address.. He he... Thanks you so much for joining us this week at CCCB! What a pretty card! Love the tri-fold. Congrats on it being chosen as a spotlight card! Thanks for your tip about stitching on my cards!I am working on it :). And it's true; it gives more depth and the card looks completely different. Congrats with you as a spotlight artist on CCCB! Beautiful. LOve the colors n the shape too.